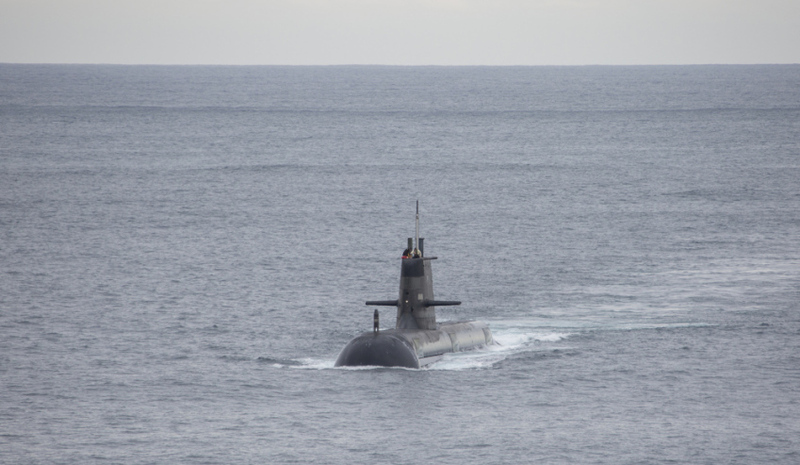 Collins Class Submarine HMAS Waller enters Jervis Bay during a visit to the East Australian Exercise Area.. Image via Commonwealth of Australia, Department of Defence. The future of the Collins Class sustainment project at ASC is facing risks from a reduction in capability following the movement of a number of key staff in recent months to other companies in the industry. It is understood that key engineers, technical staff and management, some with over a decade of experience, have left the project to join other businesses in the defence industry. ASC chairman Bruce Carter said the sustainment of Australia's existing submarine fleet, which recently came off Defence's Projects of Concern list, will face more hurdles if key staff continue to be lost. "As a board, we have identified that probably the major risk to the Collins program is the loss of capability in terms of the people," Carter told a Senate inquiry. "We have lost key people in the last two to three months to Naval Group and to other industry participants. "We have raised with all of our stakeholders that, if we lose capability, then that will prejudice our ability to continue to deliver what we have done with Collins." This is not the first time the project has encountered issues. Following the commission of the Collins Class submarines in the 1990s, the Australian-built submarines experienced technical problems across its combat systems, periscopes and propulsion. But Minister for Defence Industry Christopher Pyne said despite the issues faced by the project, its poor reputation was somewhat unfounded. After an organisation-wide reform of the program in 2012, the program is now performing at or above international benchmarks. In August this year, ASC announced it secured a further five-year contract for the sustainment of the Collins Class submarine fleet and in October it was announced work was underway to fix obsolescence in the control system as well as communication improvements to help keep the submarines going until the Future Submarines come online. The staff lost so far could just be the tip of the iceberg, with Carter noting, besides the UK and the US, other nations are facing the same issue of finding staff with the relevant level of experience. "[In] Australia, there is a finite workforce of people who have the skill base in these industries," Carter said. "It follows from being a small nation. Other than the United States and perhaps Britain, all countries have the same issue. We have Collins, which must be maintained for a long extension of life, and we have Future Submarine. "The skill bases across both of those programs require significant numbers of people. We will protect Collins. We wish to work with Naval Group. What we don't want is for the programs to either be prejudiced or for a massive bidding-up of the cost, which will ultimately be borne by the Commonwealth." Carter has called for more collaboration between the Future Submarine builder, ASC and the Submarine Group and for the government to better co-ordinate the skills base between the projects. "We seek to work with Naval [Group] ... and the Submarine Group headed up by Steven Johnson, to co-ordinate the use of what is a scarce resource," said Carter. "There needs to be more collaboration between ... Naval Group, ourselves and the Submarines [Group], and then you've got the high-tech requirements of shipbuilding. "Really it needs an overarching approach from the ultimate customer to co-ordinate where these skill bases go. There are two points. One is not to let them go. You don't want to lose a skilled engineer in submarines and he goes off and runs a farm. You don't want to lose the skills. Two is that you want to be able to co-ordinate the skills across all of the different programs." Naval Group was selected as the successful designer and builder of the 12 Future Submarines for the SEA 1000 project in April 2016. The 12 submarines will be built in Adelaide with construction to commence in in 2021-22. Construction will run into the late 2040s to 2050 timeframe. While the submarines are still in the concept design phase, the size and shape of the vessels have been decided.